There are three types of time intervals for reports in the Apache / IIS Log Analyzer program: Week / Month / Custom. A Week report is created right after you add new log files and shows the latest 7 days out of entered data. You can move to the previous or next week using the navigation buttons (left and right) located in the lower-left corner of the program. If log files added to the program cover a time interval larger than a week, build a Month report. To do it, click to the Month button (tabs are located in the upper-left part of the program window) and click the Refresh button. The Refresh button is located in the main toolbar. 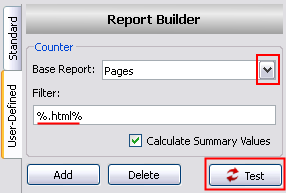 If the data collected in the report covers a time interval larger than a month, use the Custom button. You can also use this section to select the time interval. Click the Refresh button to build a report. If you need to analyze several separate parameters from different reports and get them together in one diagram, open the User-Defined tab. You will see the list of parameters in the left part of the program window. Enter the parameters you are interested in to filter field, select the time interval and click the Test button. If you need to track the activity of a certain visitor and you know his IP address, enter the visitor's IP address in the Visitor / IP field in right-upper and click the Search button. You will see all log analysis information about this visitor's visits sorted by dates, including visit dates, visited resources and referrers / search engines that brought him to your site. 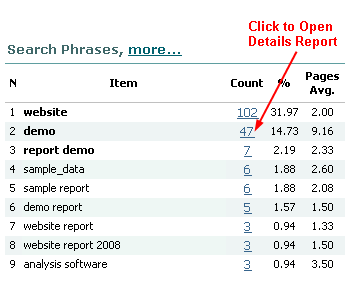 Besides standard reports, you can view detailed information about the depth of visits by a certain search engine or search key phrase. To do it in the above mentioned reports, click the link of the necessary parameter - you will see the Details tab where you can view detailed information about visitors who came from this search engine or by this key phrase. It will allow you to evaluate, for example, the effectiveness of this resource - when, how many and how well targeted visitors it brings you.